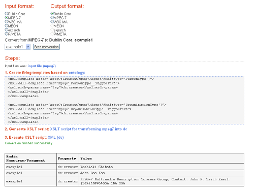 This application demonstrates how XSLT can be employed in order to perform a mapping of a given metadata document to a selected output format. The mapping instructions (XSL templates) are derived from the extended meon ontology. 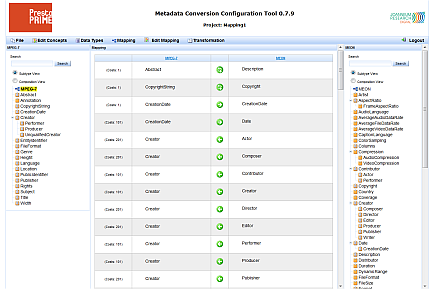 The Metadata Conversion Configuration Tool provides a way to build and customise mappings that can be executed automatically by the semantic conversion service. Please contact prestoprime@joanneum.at in order to get a user account. This application demonstrates graphically how individual metadata concepts coming from different metadata formats are related by using the extended meon ontology. 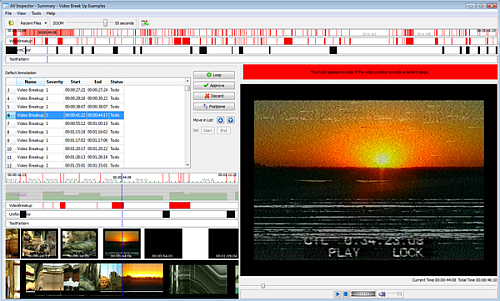 One application allows for automatic, content based video quality analysis in order to detect different defects (noise, video breakups…). A second application supports efficient interactive verification of automatic analysis results for final human quality judgment. This work has been partially supported by the European Commission under the contract FP7-231161, "PrestoPRIME"